SOFIA: The European Union´s top official launched a stinging attack Wednesday on President Donald Trump, slamming his "capricious assertiveness" and saying the US leader acted more like an enemy than a friend. 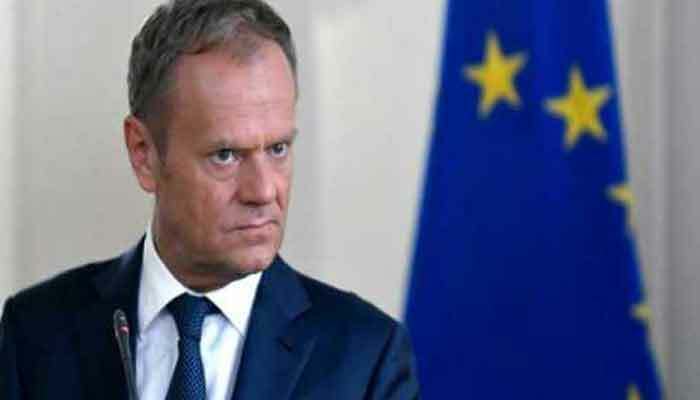 EU president Donald Tusk urged leaders meeting in Bulgaria to form a "united European front" against Trump´s withdrawal from the Iranian nuclear deal and his move to impose trade tariffs on Europe. Tusk even compared the US administration to Europe´s traditional foes Moscow and Beijing as he launched his broadside before a dinner of the 28 leaders in Sofia where they discussed the issue. "Looking at the latest decisions of President Trump, someone could even think with friends like that, who needs enemies," Tusk told reporters. "But frankly speaking, Europe should be grateful to President Trump, because thanks to him we have got rid of all illusions. He has made us realise that if you need a helping hand you will find one at the end of your arm." Tusk called for more unity in the divided EU -- which is set to lose Britain as a member next year -- to face the growing challenges. "Besides the traditional political challenges such as the rise of China or the aggressive stance of Russia, we are witnessing today a new phenomenon: the capricious assertiveness of the American administration," Tusk said. "I have no doubt that in the new global game, Europe will either be one of the major players, or a pawn. This is the only real alternative." After the talks, a European source told AFP the leaders agreed on a "united EU approach" on the Iran deal, including continued support for the agreement if Tehran abides by it. They also agreed to "initiate work to protect European companies negatively affected by the US decision," which involves Washington reimposing sanctions on the Iranian nuclear programme. "The EU will continue fighting for a rules-based international system despite recent decisions on climate change, tariffs and Iran," the source said after the leaders met over dinner in Sofia. British Prime Minister Theresa May, German Chancellor Angela Merkel and French President Emmanuel Macron -- whose countries are the signatories to the Iran deal along with the US, Russia and China, gave their views on the situation to their colleagues, he said. "Despite all the difficulties we have these days, the transatlantic relations are and will remain of outstanding importance," Merkel told the German parliament. On Trump´s decision to impose tariffs on steel and aluminium imports, a move the EU has warned could spark a trade war, the leaders also presented a united front. They backed plans to offer concessions if the US gives Europe a permanent exemption from the tariffs, but added that the "EU will not negotiate with a gun at its head". Tusk said earlier that it was "absurd to even think that the EU could be a threat to the US" in terms of trade. The EU has called for "utmost restraint" after Israeli forces killed 60 Palestinians during clashes and protests along the Gaza border against the opening of the US embassy in Jerusalem, in the conflict´s bloodiest day in years. Wednesday´s dinner will be followed by a summit on Thursday where EU leaders will meet their counterparts from the Balkan nations of Albania, Bosnia, Kosovo, Montenegro, Macedonia and Serbia.